On 1 January 2013, a new version of the zero-interest loan (prêt à taux zéro – PTZ) came into force. It is more restrictive than previous versions, with lower eligibility ceilings and a sharper focus on new housing (and old “HLM” council housing). Here we review the measure’s possible consequences. Given the great pressure on today’s rental market (Le Bayon, Madec and Rifflart, 2013), the goal of facilitating access to homeownership for first-time buyers with low down payments is commendable. Nevertheless, some questions need to be asked: are the poorest households the primary beneficiaries? Does a PTZ loan trigger the purchase of a first principal residence (an incentive effect) or does it simply accompany the purchase (a windfall effect)? Has the development of PTZ loans and their long-term implementation significantly helped expand supply on the market for new properties? And is the budgetary expenditure associated with the measure cost-effective in light of the overall results? Established in 1995 to facilitate access to homeownership for poorer households, zero interest loans have evolved since then along with budgetary constraints and political decisions. In 2005, the scheme, previously reserved for the purchase of a new home (or an existing home needing extensive renovation), was extended to include the acquisition of existing homes with no conditions on renovation in order to increase homeownership in areas with a shortage of land (including Paris). This led to doubling the number of PTZ loans granted in 2005. Similarly, in 2011, the removal of eligibility ceilings allowed the programme to set a record with the grant of nearly 352,000 PTZ loans. In the context of the fiscal and real estate crisis, the reappearance in 2012 of ceilings on income and the elimination of old dwellings (excluding HLM housing) from the programme’s eligibility list reduced the number of PTZ loans to a historically low level (64,000). On paper, the principle of this “reimbursable non-interest-bearing loan” is simple: in return for the agreement of a loan at zero interest, the banks benefit from a tax credit in the amount of the uncollected interest. This loan, which is limited to a certain loan-to-value ratio , must be associated with a mortgage, or principal loan, and can therefore be considered as a personal contribution during the acquisition of the principal residence, thus at the time the principal loan is granted. In fact, calculating the volume of PTZ loans granted is complex, as it involves ceilings on income and on the transaction amounts, which depend on the geographical area and the loan-to-value ratio. Similarly, the terms of repayment (the duration and grace period) are defined based on membership in an “repayment bracket” (tranche de remboursement) that is calculated based on the household’s resources and composition. Are PTZ loans stimulating the supply of housing on the market for new properties? One of the stated objectives when creating the programme was to support and boost a sluggish market for new properties. It is actually difficult to assess the impact of PTZ loans on the construction market. 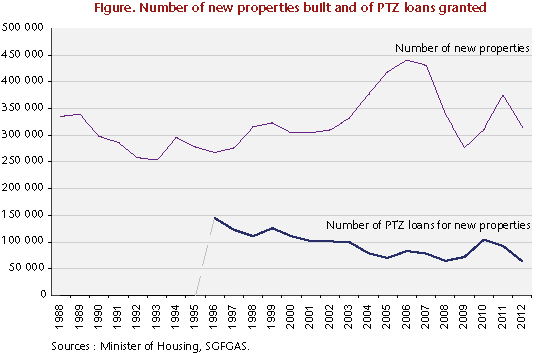 Observing the evolution of the number of dwellings constructed before and after the implementation of PTZ loans (Figure 1), it does not appear that the 150,000 PTZ loans granted in 1996 had a significant impact on the volume of new housing units. From this quick observation seems to emerge the idea that even without the programme, and taking into account the rather mild economic situation, the housing market would have been equally dynamic. Similarly, the growth observed on the new property market over the period 1999-2007 is not attributable to the programme to facilitate homeownership . According to the latest available statistics (SGFGAS 2012), as with incentive schemes for rental investment (Madec 2013, Levasseur 2011), the zones established during the implementation of PTZ loans leave it very difficult to direct investment into the areas under the greatest pressure. Thus, in the third quarter of 2012, more than half of PTZ loans were granted for purchases in Zone C, that is to say, the area least susceptible to market pressures (against 15% for Zone A ). This is largely explained by the extreme scarcity (and high cost) of land in Zones A and B. It was in order to end this form of geographical discrimination that in 2005 the system was opened to old housing. Over the period 2005-2011, more than a million PTZ loans were granted for the acquisition of an existing dwelling, thereby betraying one of the initial objectives of the programme. Finally, despite a willingness to promote high environmental quality housing, including through the provision of higher loan-to-value ratios for energy-efficient housing (BBC) , the PTZ loans have played only a small role in the construction of BBC housing, as in the third quarter of 2012 two-thirds of the loans granted were for the purchase of housing that does not meet BBC standards. Do PTZ loans facilitate homeownership for poorer households? One of the main criticisms of PTZ loans is the poor quality of the targeting. Whereas the purpose of the programme is to help households in the greatest difficulty by financing an initial down payment, the particularly high level of the income ceilings (when they are not simply eliminated entirely as in 2011) has meant eligibility for households with no a priori need for the State in order to acquire property. For example, the eligibility ceiling in 2012 was 43,500 euros annually for one person wishing to acquire a principal residence in Zone A. This ceiling made ​​90% of households in the Paris region eligible for PTZ loans (source: INSEE) . Furthermore, numerous studies have attempted to measure the impact of PTZ loans on household financing capacity (ANIL 2011, Beaubrun-Diant 2011, Gobillon and Le Blanc 2005, Thomas and Grillon 2001). Gobillon et al. thus concluded that PTZ loans “trigger the purchase” for only 15% of homebuyers. In other words, according to the model proposed by the authors, 85% of households have access to the property with or without the PTZ. Similarly, recent studies on the profile of homebuyers (Le Bayon, Levasseur et Madec 2013, Babès Bigot Hoibian 2012, INSEE 2010) highlight how it is becoming increasingly difficult for poorer households to purchase a home. Thus, according to Le Bayon et al., households in the lowest quartile of living standards, the households targeted by the homeownership programme, have seen their chance of acquiring a principal residence halved between 2004 and 2010. In view of these various results, it seems that the PTZ loan programme is having difficulty, at least in its earlier versions, playing a role in helping low-income households to become homeowners. This conclusion may need to be nuanced, however, if we look at the latest statistics provided by the SGFGAS. According to these data, workers and employees accounted for 25% and 33% respectively of the recipients of PTZ loans in the third quarter of 2012. Similarly, one out of three recipients belonged to the lowest “repayment bracket”. However, as the calculation of these brackets takes into account particularly high income ceilings, membership in the first repayment bracket is not really equivalent to meeting “poverty criteria”. Finally, by increasing demand for new housing on a market with low supply elasticity and by allowing many households to acquire more expensive housing, programmes to assist homeownership have long been reproached for their inflationary effects (ANIL, 2002). The PTZ programme:how much does it cost? For 2012, the cost to the State for the PTZ programme was 1.34 billion euros. Given the number of beneficiaries, this may seem expensive, but, like all public assistance programmes, it needs to be analyzed in terms of efficiency. Thanks to a PTZ loan, “non-triggered” households increase the amount of their purchase by 3%. Overall, therefore, according to our estimates and under the assumptions spelled out above, in 2012 the PTZ programme stimulated almost 2 billion euros in investment in housing at a tax cost of 1.3 billion euros. The multiplier effect was therefore 1.5. This is in the lower range of what has been observed in other countries with similar programmes (1.5 to 2). This multiplier could be much higher if households were targeted more rigorously. Indeed, for the “Tranche 1” repayment bracket, under the above assumptions and considering that this segment accounts for half of the tax expenditure (a generous assumption), the multiplier is 2.6. However, we are still far from the optimal theoretical multiplier of 6 estimated by Gobillon and White . What about the 2013 version of the PTZ? Re-establishing repayment deferrals of up to 15 years for households in the lowest repayment bracket. For the most part, these measures will help to target assistance for homeownership more accurately. However, some improvements could still be made. In 2013, the income ceilings for Zone A still include about 80% of inhabitants of the Paris region. In addition, the possibility of acquiring existing HLM council housing, which is potentially very energy-consuming, seems inconsistent with the promotion of new energy-efficient housing. For low-income households in high-demand areas, would it not be better to promote the purchase of housing that, while not new, has energy characteristics closer to what is required for new housing? Likewise, re-establishing the principle of repayment deferrals of up to 15 years could prove objectionable. Indeed, it may lead to undermining the solvency of some households by reducing the duration of their principal loan. The banks, taking into account the deferral, tend to align the duration of the principal loan with the duration of the deferral in order to avoid an excessive jump in the future monthly repayment. So, the deferral may on the contrary increase the risk of default, as, once the deferral is over, households may be hit by a surge in their monthly payments (Bosvieux and Vorms, 2003). Finally, the freeze on transaction ceilings cannot be sustained given first, the growing gap that exists between the ceilings and market prices, and second, the continuous increase in construction costs resulting from the normative inflation experienced by the sector. To conclude, it is important to take note of the existence of a debate over the very need for a programme to assist homeownership: should the State encourage, assist or finance homeownership for renters? Should taxpayers help renters to become homeowners, as with tax incentives for investment in rental housing? For the poorest households, who find it impossible to come up with a sufficient personal contribution for a purchase, it may seem reasonable to assume that the State is playing its role by helping the most vulnerable to follow the standard residential trajectory, from cohabitation with parents to rental and then ownership. For others, we cannot rule out the existence of significant windfall effects, as outlined above. To avoid these problems and improve the financial positions of the households originally targeted by the programme, a thorough overhaul of programmes to promote homeownership (social or otherwise) is essential. That is, a maximum percentage of the amount of the transaction. The new property market was, for the period under consideration, boosted strongly by programmes to stimulate rental investment (see Le Bayon et al. 2013). Paris, the near suburbs and part of the outer suburbs. In 2012, for purchases in Zone A, the loan-to-value ratio was 38% for new energy-efficient (BBC) housing versus 26% for non-BBC. For an annual income of 43,500 euros, assuming a rate of 3.2%, borrowing capacity came to an average of 260,000 euros (excluding the PTZ loan), i.e. a housing unit of at least 50 sq.m in the near Paris suburbs (excluding the communes bordering Paris). These assumptions are in accord with the results of the modelling proposed by Gobillon and Le Blanc (2005). The latter found a multiplier effect for the PTZ programme on the order of 1.1 to 1.3. This multiplier was estimated by assuming perfect targeting for the programme, that is, that all the beneficiaries are “triggered” households.